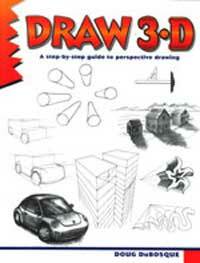 Grade 4 Up-Using easy-to-follow, step-by-step sketches, DuBosque introduces readers to the techniques of three-dimensional drawing. Beginning with such elementary concepts as depth, he progresses logically through shading, reflections, and multiple vanishing points. The supportive tone encourages novices to keep trying and not become discouraged. The drawings of what can go wrong and how to correct these errors are particularly helpful. Sure to be popular with budding artists of all ages, this is a good choice for any collection.